What’s not to love about aperture cards? They are cool to look at and they will bring a fun, interactive element to your design! If you’re wondering how to create different types of aperture card, well, you have come to the right place! 1. Cut out a square window on the front of your card, toward the top. Adhere a piece of First Edition Grand Plans 12x12 paper to the front of the Dovecraft 5x7 card blank. Flip over and carefully cut around the window to creature the aperture. 2. Cut two 6 x 17.5cm pieces of Dovecraft green card stock. Place one piece inside of the card and draw around the aperture. Cut this piece out. Adhere to the inside of the card blank. Adhere the second piece of green card to the inside, at the back. 3. Cut a piece of green card down to 25cm x 17.5cm. With the piece of card horizontal, make a vertical score down the middle of the card. Fold in half along the score line and place into the card blank, draw around the aperture. Measure in half way on your aperture square and score above and beneath the aperture square to the top and bottom of the card, making sure not to score through the aperture you have drawn. 4. With the card blank open, measure in 6.2cm from the right hand side, and do a vertical score line from the top of the card blank to the bottom. Next, only cut out half of the aperture as shown, cutting up to the score line. 6. Cut two coordinating pieces of Grand Plans 8x8 paper down to 5.5 x 17cms, adhere to the two inside sections. Next cut out a Grand Plans paper design down to a 7.5 cm square and adhere to the aperture. 7. Cut the stereo image from the 12 x 12 pad to use as the main image on the card. Adhere to the inside of the aperture with 3D foam pads. 8. Cut out your chosen sentiment from the First Edition Grand Plans 12x12 Paper Pad and adhere it underneath the aperture on the front of the card. What a cool design, especially paired with the striking Grand Plans paper designs! You could also create a circular aperture card, then add a raised circular card inside the aperture to create a fun penny spinner card! Maxine has added an emoticon die cut to the penny! How will you use Maxine’s cool aperture card ideas? 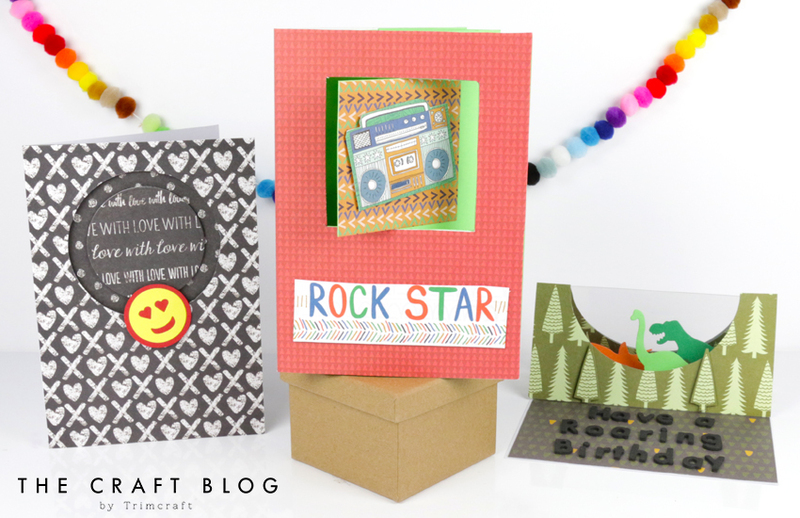 We would love to see so don’t forget to #trimcraft when uploading to social media and to share your makes in the Inspiration area! Nice Aperture cards like the Roaring birthday card to.